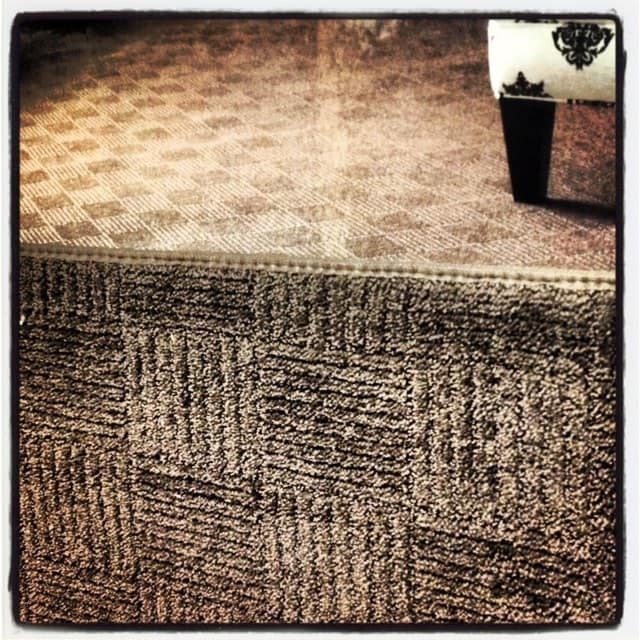 A few weeks ago I was contacted by some classy ladies from Mohawk Carpet. 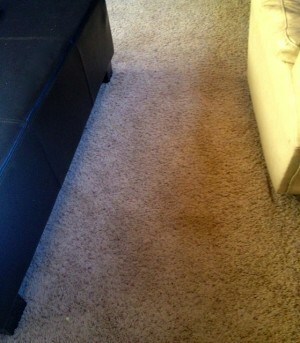 They asked me if I’d partner with their company in a new program called ‘Mohawk Floors Me’ with new carpet for our home. Today I’m announcing my partnership with Mohawk, and that I’ll be blogging my way through the process of new carpet installation over the next month, because it is just THAT. Upgrading or buying anything new takes research, time, energy, and you want to give it your all when it comes to being smart and wise with money. I think it can be an overwhelming process if you don’t do the right research ahead of time. I’ll start with the story of our home, built in 1978, a home which we’ve lived in for almost 8 years now. We bought our home–a fixer-upper with a NW flare of high ceilings, dark beams and a family room loft–and ripped out the original carpets and draperies. We also had to put a new roof on the home, paint the entire inside and outside, and upgrade the yards. We had a budget and we stuck with that budget, doing most of the work ourselves. 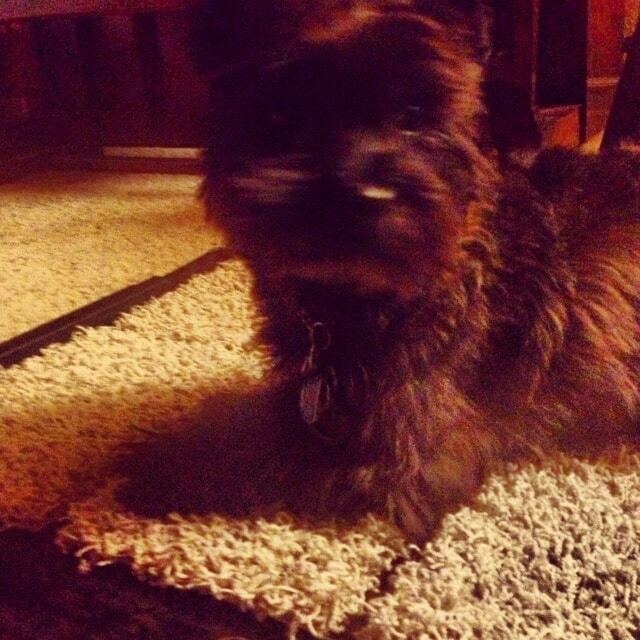 One thing we did not spend a lot of money on (or research) was the carpets. The carpet we put in back in 2005 was better than what was here, obviously, but it was inexpensive and truthfully, it did not last. When you consider our 3 kids were 9, 11, and 13 when we moved in, all soccer players, and when you take those teen years x 7, all of their friends who’ve come in to our home, guests who’ve visited, and 3 pets on top of that — you need a sturdy, reliable carpet if you want it to last for years. We’ve had so many parties–birthday, soccer, holidays, you name it– where food has spilled. Master bedroom is a high traffic area, with an entrance to the outside and right off the kitchen hallway. We’ve often eaten meals together in the family room. Living area is an “appetizer” zone for entertaining. We garden year round and during the winter months, the carpet gets more wear and tear, even though we leave our garden shoes outside. Pool activities (lots of kids) and bare feet bring more wear to the carpet. 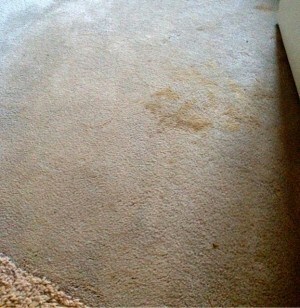 Because of the light color, we have to get it professionally cleaned quite often ($$). I know, we are a normal family. 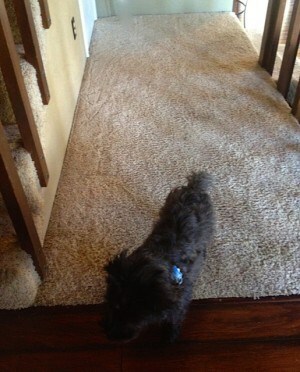 And now it’s time to upgrade our carpet! 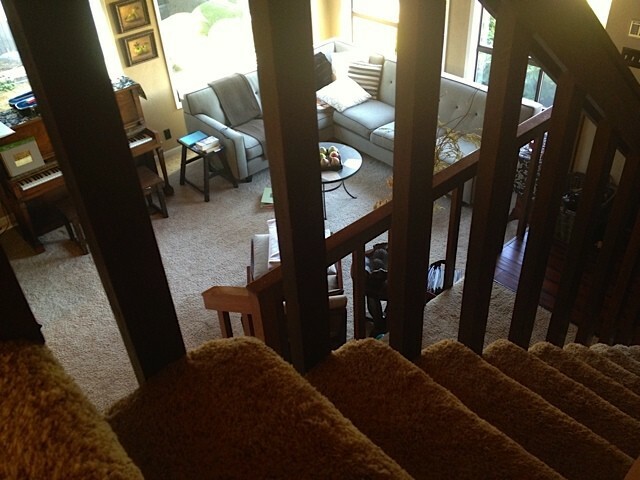 Here at RE I’ll be telling you why we made the choices we did using Mohawk’s SmartStrand with DuPont Sorona or SmartStrand Silk with Dupont Sorona carpets, and I’ll uncover some myths we dispelled during the shopping process. I plan to walk you through the actual installation process, host an exciting GIVEAWAY, and will end with the big REVEAL. Maybe we’ll even have a little dinner party to celebrate the end results. I’m not sure! Oh, and one thing we decided was that because Habitat for Humanity has been so good to us over the years (we’ve often found exactly what we’ve needed for different projects at their store), we plan to donate the usable pieces of our current carpet back to them. What we’ve been given, we will give to others. Next post (about the program) will be about my shopping experience in town, and our research. But for now, I’m cracking up with this picture of Haggis (the little culprit), because last night (my Instagram pic) as we brought some samples of carpet home, look who claimed them for the night!? How old is the carpet in your home, and how does it do with life’s wear and tear? 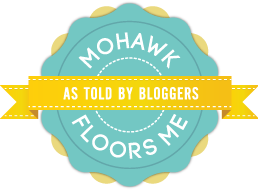 I’m partnering with the “Mohawk Floors Me, as Told by Bloggers” program, and will be receiving all of our padding, carpet, and labor as a part of the project; but as always, all opinions and experiences are my own.